Continuing the new hit-focused format established last year, 2016-17 SP Game Used Hockey tweaks things again. Now yielding six cards, four of the cards in each hobby box will be autographs or memorabilia cards. A collecting favorite, Authentic Rookies delivers cards for the first-year players that are limited to their jersey number. So do the 100 base cards for veterans. The final card in each print run is signed. Base parallels include Rainbow (#/200 + player's age), Orange Rainbow (#/100 + player's draft year), and Green Snow Storm (1/1). Adding relics, Gold Jersey (#/499) and Gold Spectrum Patch (#/49) memorabilia parallels provide more Authentic Rookies options. Lastly, the signed Authentic Rookies and base parallels include Blue Auto (1:6 packs), Red Auto Jersey (1:12 packs) and Red Spectrum Auto Patch (#/25). Putting the game-used aspect into 2016-17 SP Game Used Hockey are a mix of relics from specific 2016 games. 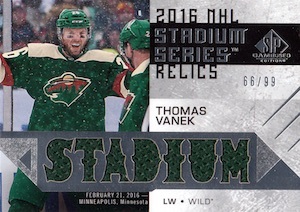 This includes 2016 NHL Stadium Series Relics and 2016 NHL Winter Classic Game-Used Pucks. 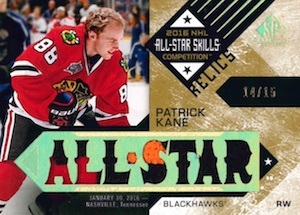 Focusing on the All-Star Game are 2016 NHL All-Star Skills Relic Blends and Game Gear 2016 All-Star Skills inserts. 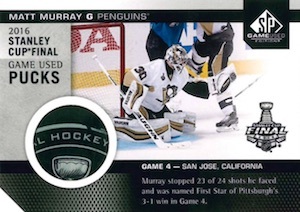 The memorabilia-based set even visits the site of the title with 2016 NHL Stanley Cup Finals Materials in the form of Game-Used Pucks (1:840 packs), Net Cord (#/25) and Net Cord Shield Logo (1/1) versions. 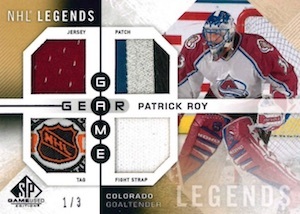 2016-17 SP Game Used Hockey also offers several familiar insert lines with Game Gear, Supreme Patches and Supreme Gloves/Pads. Draft Day Marks is back with signed letters for Veterans (#/10 per letter) and Rookies (#/35 per letter). There are even a few new additions to the brand with Banner Year inserts that showcase event-used banners along with Auto parallels. Frameworks takes a unique approach to relic cards with a jersey design. Pack odds key: h = Hobby, e = ePack, r = Retail. 199 cards. True base cards only found in Hobby packs. *Actual base jersey number card is signed in many instances; i.e. 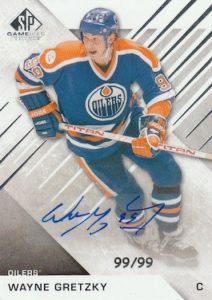 Wayne Gretzky’s base card is numbered to 99 copies and card #99/99 is signed. PARALLEL CARDS: Rainbow Player Age #/256 or less, Orange Rainbow Draft Year #/199 or less (Hobby), Green Snow Storm 1/1, Base Autograph 1/1 (Hobby)*. *All subjects not included in base Autograph parallel. View specific options with the full spreadsheet. 113 cards. Specific group odds noted below. Group odds are different for Veterans and Rookies. Overall Odds: Veteran Auto - 1:10 hobby/ePack, Authentic Rookies Auto - 1:6 hobby/ePack. Overall odds - Veteran 1:3 hobby/ePack, Authentic Rookies #/399. PARALLEL CARDS: Gold Spectrum Premium: Veterans #/25 or less; Authentic Rookies #/49. View specific parallel options with the full spreadsheet. Overall Odds - Veterans 1:20 h/e, Authentic Rookies 1:12 h/e. Group odds are different for Veterans and Rookies. PARALLEL CARDS: Red Spectrum Premium: Veterans #/15 or less; Authentic Rookies #/25. 44 cards. Specific group odds noted below. 5 cards. Specific group odds noted below. Overall Odds - 1:60 hobby/ePack. 7 cards. Specific group odds noted below. Overall Odds - 1:70 hobby/ePack. 44 cards. Serial Numbered #/99. 20 cards. Specific group odds noted below. Overall Odds - 1:6 hobby/ePack. 44 cards. Serial Numbered #/35. 20 cards. Serial Numbered #/99. Specific game (G) noted below. 1 card. Serial Numbered 1/1. 22 cards. Serial Numbered #/35. Short Prints Overall Odds - 1:695 hobby, ePack Achievement. 8 cards. Specific group odds noted below. Overall Odds - 1:233 hobby/ePack. Draft Banner Overall Odds - 1:8 hobby/ePack. Year Draft Overall Odds: 2012 Draft - 1:19; 2014 Draft - 1:28; 2015 Draft - 1:41; 2016 Draft - 1:83. 2012-2016 Draft SP Odds - 1:170 h, ePack Achievement. 14 cards. Specific group odds noted below. Overall Odds - 1:47 hobby/ePack. Overall Odds - 1:15 hobby/ePack. Series Overall Odds - Chi vs. Min 1:33; Col vs. Det 1:28. Short Prints Overall Odds - 1:212 h, ePack Achievement. Overall Odds - 1:8 hobby/ePack. Banner Year Overall Odds: 2013 Finals - 1:22; 2014 Finals - 1:24, 2016 Finals - 1:27. Short Prints Overall Odds - 1:377 h, ePack Achievement. Overall Odds - 1:9 h/e. Banner Year Overall Odds: 2015 WC - 1:17; 2016 WC - 1:19. Short Prints Overall Odds: 2015 WC- 1:494 h, 2016 WC - 1:565 h, ePack Achievement. Overall Odds - 1:466 hobby/ePack. 40 cards. 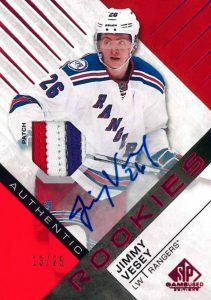 Rookies - each letter in last name #/35 (*Card #AM - #/10), Veterans - each letter in last name #/10. 36 cards. Specific group odds noted below. Overall Odds - 1:12 hobby/ePack. 69 cards. Serial Numbered #/6; NHL Legends #/3. 29 cards. Serial Numbered #/499. 28 cards. Serial Numbered #/99 or as noted. 26 cards. Serial Numbered #/199. 121 cards. Serial Numbered #/15. Always love SPGU. Being a Minnesota Wild fan I love the fact that we’re finally getting some love and not have a crap checklist that we normally do. Last year SP Game Used was a tremendous disaster. The 4 hits announced can prove to be 4 huge flops. In 2 cases last year, the 3 additional Memorabilia cards were white jersey, after white jersey, after white jersey of insignificant players. Let’s hope this year things will be better. They added a card which is not bad, but they still kept the one billion All Star Game sets and Manufactured patches that generally nobody is interested in. 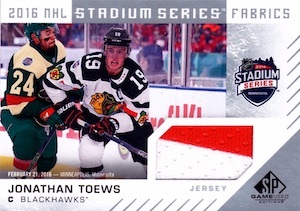 The Banner set seems a good idea, as well as the 2016 Winter Classic Material Net Cord Shield Logo. 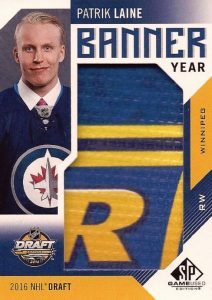 Also hitting a Laine or Matthews will pay a lot, since their Jersey Number are 28 respectively 34, so a reduced number of Rookie cards. I’ve been really looking forward to SP Game Used. 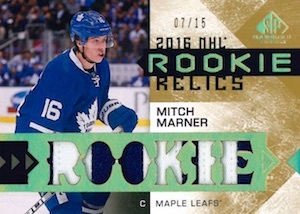 The 14/15 cards were some of my favorites but last year’s stuff…the less said the better! Seems like a lot of cool stuff this year and with 6 cards in a pack and a lower price I’m excited. Having said that, UD has let me down before so I guess I am cautiously optimistic. Is this some kind of joke? Why does comments like this with such complete misinformation are accepted? This man doesn’t have a clue what he’s talking about. DELETE! Also, the card design is odd. What is with Grass on the 1/1 base? Look at the size of the checklist!!! Why would a long checklist be a complaint? 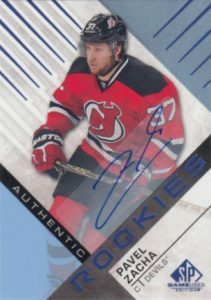 The simple short checklists are one of the biggest knocks that alot of the recent upper deck hit products have received because a massive portion of the market for hit products are group breakers…and when group breakers buy a team for a case of a hit product they want lots of possible cards to be possible for their team…long checklists are great for that!! 1. A diluted value of the players and of the monetary value per se, because at a certain point, if you have a billion sets and subsets you can’t only put Toews, Ovi and Crosby in there. Look at the rookie checklist. There are names there you’ll never see again in no other collection. Also, who cares about the billion All Star sets and subsets? 2. And most of all, it means redundancy. In this specific case there are many sets with jersey: base materials, all star fabrics, stadium series fabrics, stadium series blends, banners, ink sweaters. And almost all these sets have parallels and subsets. I know it’s Game Used, but still. That means that your case will be filled with worthless jersey cards. Anyhow, there are positive points to a big checklist, but I think people can dislike a collection like this and personally also prefer a smaller checklist. 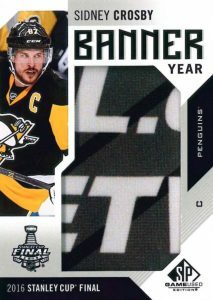 They could have made for example a smaller product dedicated to the NHL All Star Game, and put all these cards in there, but I’m pretty sure they know people will not purchase that. 1. St. Louis has no Authentic Rookies to chase, the only team to not have one. 2. Colorado has one Authentic Rookies (Bigras) and his jersey is to 3 so good luck there, at least if you hit Bigras, it’s worth beaucoup bucks to an Avalanche collector. Bigras has the lowest jersey number in the AR list. 3. Other teams with only one AR: Edmonton, LA, Nashville, Tampa Bay, and Washington but keep in mind, they can have a higher jersey number so may have better chance of hitting compared to other teams with 2-3 rookies. 4. Minnesota has two rookies (Reilly and Ek) with jersey numbers 4 and 14. 5. Philadelphia has three rookies (Provorov, Konecny, Lyubimov), all fairly low numbered at 9, 11, and 13. 6. On the flip side, Toronto must be dressing a team full of rookies as all the jersey numbers added up to 105,683 (give or take). IMO, other than Toronto, teams worth a look into are Arizona, Columbus, Philadelphia, and Winnipeg. As for Canucks fans, Stetcher (#51) and Tryamkin (#88) have Authentic Rookies but not Demko. Watching a couple of cases opened, it seems like the same old release, bunch of jersey cards and an auto or two. Haven’t seen Frameworks in person although the breakers were impressed. Have no idea why you would include Banner Year, are we going the way of Panini and adding whatever garbage the players touched…are we going to see event used chairs next? I almost bought a box or two and thought I’d check out some case breaks first. I’m so glad I did because once again UD has screwed the collector. Lowering the price point and giving us 6 cards eh? They must think people are idiots and maybe they are because I’m not spending $115 Can on a bunch of worthless jersey and numbered cards. Many if the boxes I saw opened maybe had $20-30 in value and only a few rare ones had great cards in them. I’m so tired of UD and after finishing the series 2 set I’m done. I’ll finish previous years’ sets and get the cards I want on eBay. No new product! Only breakers and rich old men have $ to throw around on UD products. Thanks UD for ruining the hobby. In any other year I would rate this a 5 hands down. What is stopping that rating? Simple, it is UD’s choice to release more and more products on ePack. Just like UD1, UD2, OPC Platinum, SPx and now SPGU is going to be released on ePack this year. Sorry…a big booooooooo to UD and the finger that you are giving to the hobby shops. You see the trend right? Eventually every product will be released on ePack, it’s just a matter of time. I feel bad for the hobby shops, just not fair at all. This product is a pure disaster. The checklist is huge and watered down by a gazillion of parallels, rookie scrubs, jersey cards etc. It’s so obvious that they configure these products for group breakers only now. The odds to get something nice are completely insane! I don’t see the appeal to open a Box (it’s actually just a pack) for e. g. a sticker Rookie Autograph of Sergei Tolchinsky, a Jersey card of Nino Niederreiter another sticker Autograph of Jake Allen and an All-Star Banner by Evgeny Kusnetzov plus two Base Cards. Not great for a personal break? Well this is what you get in 8 out of 10 boxes from SP Game Used. The Upper Deck products suffer a huge overproduction disguised by many numbered parallels and featuring almost every player who once were an NHL jersey when called up. 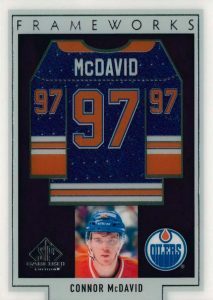 They re-use every single tiny piece out of there NHL Replicas to make hundreds of thousands of these worthless cards and put a number on it. I can only recommend to stay away. Nevertheless I’ll completely disagree with the negativity in regards to e-pack. While it’s true they hold 10-30% of the prints back (totally random), you get the same terrible cards on e-pack like you would get when purchasing physical cards. I’m also going to disagree with the negativity towards e-pack. If you took all of the cards shops in the US and Canada and put them on a map like the wireless providers do with their coverage areas, you’d probably find HUGE areas where a collector couldn’t simply walk into a shop and make a purchase so they’re left to order online from someplace or go to e-pack. Add to the fact that unless you’re in a hockey market (think Toronto/Montreal) your local card shop isn’t going to be getting a huge shipment of any of the higher end products. That was my case, since I’m friends with my shop owner I was fortunate to be able to get one of the two cases my shop had delivered. I also purchased two cases from e-pack and to be truthful, my e-pack cases yielded more value than the case I got locally. Just my .02 worth, feel free to disagree.